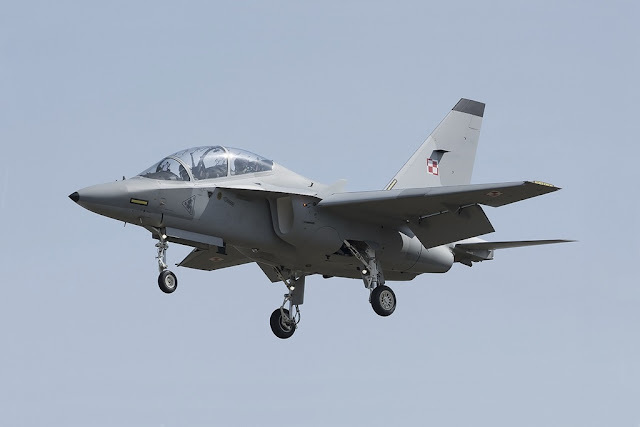 First pilot-students of the Polish Air Force to start flying on M-346 Bielik in mid-April. The Polish Air Force has selected the first 4 student-pilots who will continue their training on the new M-346 Bielik advanced trainer jet. They were chosen based on a special classification, after completing the training on the PZL-130 Orlik turboptop aircraft. Selection parameters took into account flight ability, health and language skills. Currently they are following a special training before making the first flights on the Bielik scheduled for mid-April. During an interview, the cadets said they had to face a very intense study, about 7 hours a day, which includes learning the 900-page aircraft manual. To date, they have flown with an analog cockpit while the M-346 boasts modern digital flight controls. Training to fly on the M-346 Bielik began in the second week of March in flight simulators and lasts about 4/6 weeks. It provides intensive training in the Full Mission Simulator (FMS) and Flight Training Device (FTD). The instructors said that the new technologies and approach to training represent a historic turning point for the flight school. They started preparing the new training program a few years ago based on the experience they acquired in Italy. The new program also included updating the flight phase on the Orlik aircraft. Currently, the Deblin flight school has eight M-346 Bielik trainer jets. It will receive eight more aircraft by 2022. The flight school commander estimates that they can train 10 to 12 cadets within a year. Later the young pilots will start flying on the F-16 fighter.